Scientists probing under the seafloor off Alaska have mapped a geologic structure that they say signals potential for a major tsunami in an area that normally would be considered benign. They say the feature closely resembles one that produced the 2011 Tohoku tsunami off Japan, killing some 20,000 people and melting down three nuclear reactors. Such structures may lurk unrecognized in other areas of the world, say the scientists. The findings will be published tomorrow in the print edition of the journal Nature Geoscience. The discovery "suggests this part of Alaska is particularly prone to tsunami generation," said seismologist Anne Bécel of Columbia University's Lamont-Doherty Earth Observatory, who led the study. "The possibility that such features are widespread is of global significance." In addition to Alaska, she said, waves could hit more southerly North American coasts, Hawaii and other parts of the Pacific. Tsunamis can occur as giant plates of ocean crust dive under adjoining continental crust, a process called subduction. Some plates get stuck for decades or centuries and tension builds, until they suddenly slip by each other. This produces a big earthquake, and the ocean floor may jump up or down like a released spring. That motion transfers to the overlying water, creating a surface wave. The 2011 Japan tsunami was a surprise, because it came partly on a "creeping" segment of seafloor, where the plates move steadily, releasing tension in frequent small quakes that should prevent a big one from building. But researchers are now recognizing it may not always work that way. Off Japan, part of the leading edge of the overriding continental plate had become somewhat detached from the main mass. When a relatively modest quake dislodged this detached wedge, it jumped, unleashing a wave that topped 130 feet in places. The telltale sign of danger, in retrospect: a fault in the seafloor that demarcated the detached section's boundary landward of the "trench," the zone where the two plates initially meet. The fault had been known to exist, but no one had understood what it meant. 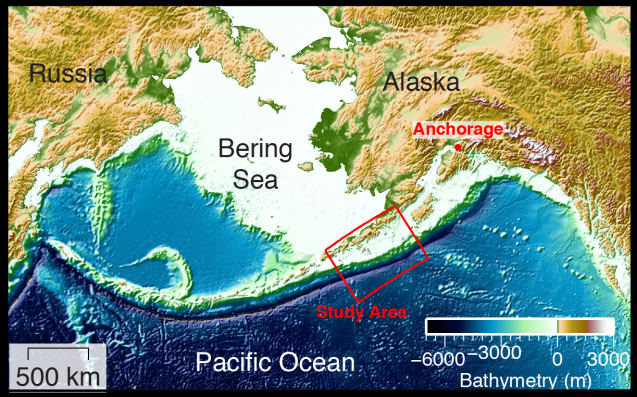 The researchers in the new study have now mapped a similar system in the Shumagin Gap, a creeping subduction zone near the end of the Alaska Peninsula some 600 miles from Anchorage. The segment is part of a subduction arc spanning the peninsula and the Aleutian Islands. Sailing on a specially equipped research vessel, the scientists used relatively new technology to penetrate deep into the seafloor with powerful sound pulses. By reading the echoes, they created CAT-scan-like maps of both the surface and what is underneath. The newly mapped fault lies between the trench and the coast, stretching perhaps 90 miles underwater more or less parallel to land. On the seafloor, it is marked by scarps about 15 feet high, indicating that the floor has dropped one side and risen on the other. The fault extends down more than 20 miles, all the way to where the two plates are moving against each other. The team also analyzed small earthquakes in the region, and found a cluster of seismicity where the newly identified fault meets the plate boundary. This, they say, confirms that the fault may be active. Earthquake patterns also suggest that frictional properties on the seaward side of the fault differ from those on the landward side. These differences may have created the fault, slowly tearing the region off the main mass; or the fault may be the remains of a past sudden movement. Either way, it signals danger, said coauthor Donna Shillington, a Lamont-Doherty seismologist. "With that big fault there, that outer part of the plate could move independently and make a tsunami a lot more effective," said Shillington. "You get a lot more vertical motion if the part that moves is close to the seafloor surface." A rough analogy: imagine snapping off a small piece of a dinner plate, laying the two pieces together on a table and pounding the table from below; the smaller piece will probably jump higher than if the plate were whole, because there is less holding it down. Other parts of the Aleutian subduction zone are already known to be dangerous. A 1946 quake and tsunami originating further west killed more than 160 people, most in Hawaii. In 1964, an offshore quake killed around 140 people with landslides and tsunamis, mainly in Alaska; 19 people died in Oregon and California, and waves were detected as far off as Papua New Guinea and even Antarctica. In July 2017, an offshore quake near the western tip of the Aleutians triggered a Pacific-wide tsunami warning, but luckily it produced just a six-inch local wave. As for the Shumagin Gap, in 1788, Russian colonists then living on nearby Unga Island recorded a great quake and tsunami that wiped out coastal structures and killed many native Aleut people. The researchers say it may have originated at the Shumagin Gap, but there is no way to be sure. Rob Witter, a geologist with the U.S. Geological Survey (USGS), has scoured area coastlines for evidence of such a tsunami, but so far evidence has eluded him, he said. The potential danger "remains a puzzle here," he said. "We know so little about the hazards of subduction zones. Every little bit of new information we can glean about how they work is valuable, including the findings in this new paper." The authors say that apart from Japan, such a fault structure has been well documented only off Russia's Kuril Islands, east of the Aleutians. But, Shillington said, "We don't have images from many places. If we were to look around the world, we would probably see a lot more." 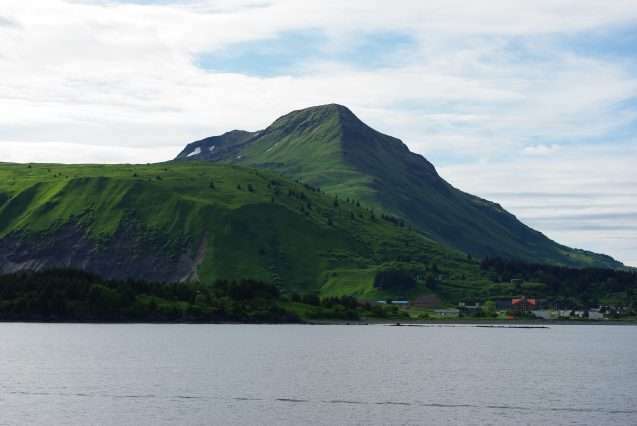 John Miller, a retired USGS scientist who has studied the Aleutians, said that his own work suggests other segments of the arc have other threatening features that resemble both those in the Shumagin and off Japan. "The dangers of areas like these are just now being widely recognized," he said. Lamont seismologists have been studying earthquakes in the Aleutians since the 1960s, but early studies were conducted mainly on land. In the 1980s, the USGS collected the same type of data used in the new study, but seismic equipment now able to produce far more detailed images deep under the sea floor made this latest discovery possible, said Bécel. 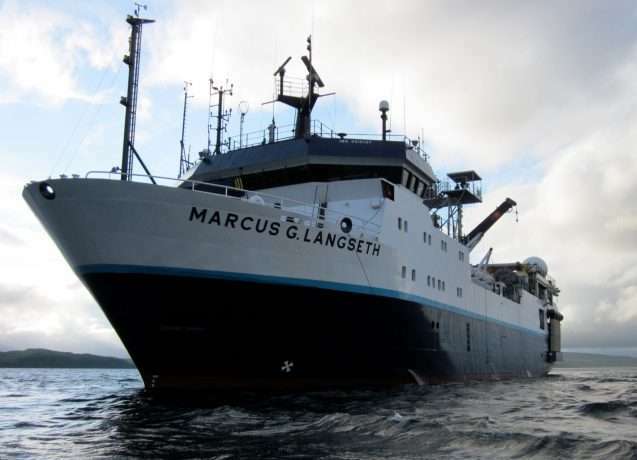 She and others conducted the imaging survey aboard the Marcus G. Langseth, the United States' flagship vessel for acoustic research. Owned by the U.S. National Science Foundation, it is operated by Lamont-Doherty on behalf the nation's universities and other research institutions.